More vacationers will take an opportunity to bond with extended family members in 2014. According to a new survey from AAA Hawaii, more than one-third (36 percent) are planning to take a multi-generational trip in the next 12 months – a four percent increase over last year. 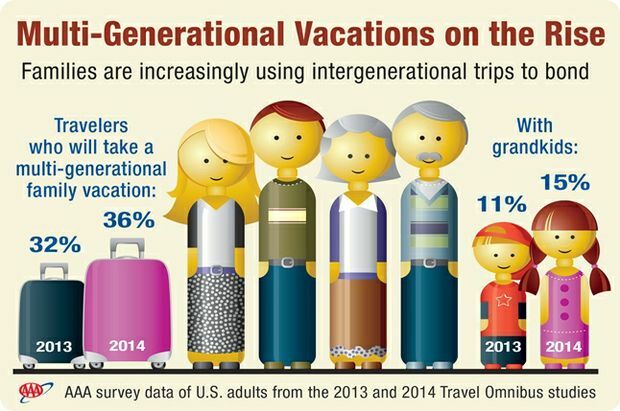 For more than one-quarter of those surveyed, their multi-generational trips will include three generations – they will travel with both their children and their parents or in-laws. Another five percent will travel with their grandparents and 15 percent plan to take their grandchildren on vacation. Have a family meeting to plan the trip. It helps to clarify expectations and avoid disappointments. Discuss who is paying for what, the behavior expected of children on the trip, and some common activities everyone wants to do on vacation. AAA paper maps can also be fun planning tools, allowing you to plan activities and must-see destinations and attractions. Use a qualified travel agent. Some family members get too tired with a packed schedule, while others will want to see as much as they can. An experienced agent knows the formula for successful multi-generational travel and can plan an itinerary that provides flexibility for rest and relaxation for those who want it, along with transportation options such as coach tours to accommodate older family members. AAA Travel agents have access to several quality travel providers with specially packaged multi-generational trips. Seek out vacation options that lend themselves to varying interests. A cruise can be an ideal multi-generational trip because it caters to multiple age levels with separate activities for children, teens, active adults and those who want to relax. These options give flexibility for everyone to enjoy what they want to do, while coming together as a family for meals, shows, sightseeing excursions off the ship and other activities. Make sure paperwork for underage travelers is in order. For trips outside the U.S. (even a Baja cruise), if you are a grandparent traveling with one or more minor grandchildren and not with their parents, or if you are a parent traveling with your child but without the other parent, you likely need a notarized letter from the custodial parent(s) authorizing you to take the child on the trip. This letter may be required by the travel provider as well as by the country you are visiting. You should also obtain a notarized letter from the custodial parent(s) granting permission to authorize emergency medical care for the child. Your travel agent has more information on these requirements. For more ideas on multi-generational vacations, visit your AAA Travel agent at your local Auto Club branch or AAA.com.